Hi friend! I hope you had a magical weekend! Mine was pretty laid back for the most part though I did go explore a bird sanctuary near the end of my street by the lake. Today’s recipe is super simple and a great way to preserve some of the fall harvest for future yummies. Because it’s a fermented recipe you’ll also be giving yourself a great dose of probiotic goodness with every spoonful! Fermented foods have been part of traditional cultures for centuries because they’re a great way to help inoculate our digestive tracts with the types of beneficial bacteria that promote healthy digestion and heightened immunity. Incorporating a small spoonful of probiotic foods with your meals can also help with immediate digestion and because they’re already been partially digested by helpful bacteria they’re much easier for your body to break down and absorb all the goodness inside. Jalapeños add a spicy zing to your meals while helping fight inflammation, clear congestion, and boost immunity, which is perfect for the cold and flu season. I like to add a spoonful of this mixture to a bowl of bone broth with some seaweed and unrefined sea salt. It makes a great post-workout drink since the combo is chock full of minerals to replenish your electrolytes after a heavy sweat session. To give your ferment a head start you’re going to be incorporating unpasteurized apple cider vinegar into the recipe. ACV is also a fermented food that contains the healthy bacteria you’re trying to cultivate in your ferment. By using this vinegar as a starter you’ll ensure that you create the healthiest fermented food in a shorter amount of time. You can also use this versatile vinegar to improve digestion and tone the skin. To create a natural toner mix 1 part ACV with 10 parts water. Dip a cotton pad into the solution and swipe over your face, followed by coconut or jojoba oil or another natural moisturizer. Before starting your ferment you’re going to want to make sure that the jar you’re using has been properly sterilized. You can do this by boiling it in hot water for several minutes or by following the directions here. 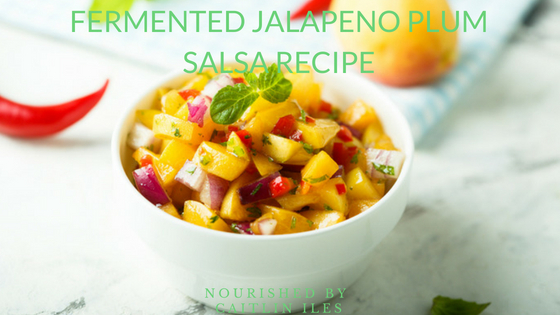 This salsa is spicy, sweet, and full of fermented goodness to help support your digestive health and immune function. Cut the top off the jalapeños and slice in half lengthwise. Roughly chop them, keeping seeds. Add to a small food processor. De-pit the prunes/peaches and cut one peach/plum into small cubes and add to mason jar. Roughly chop the remaining fruit and add to the food processor. Add sea salt, apple cider vinegar, and maple syrup then blend until relatively smooth. Pour into a clean mason jar, cover top with unbleached parchment paper, and seal. Let sit for 5 to 7 days. Once fermented move to the fridge for storage. Always use a clean spoon when reaching into the salsa to avoid contamination and prolong shelf life. Feel free to add diced red onion, cilantro, green onion, garlic, tomato, or whatever other veggie piques your fancy! This is a great salsa base that can be completely customized. Well that’s the fabulously fermented recipe for today friend! If you’re looking for more support to help you achieve your wellness goals, make sure you download my FREE Stop Self-Sabotage workbook right here! It’s jam packed with exercises and information you can use to help you kickstart your path to wellness.